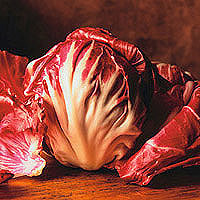 Radicchio can be found in the produce section of health food stores, specialty markets, and supermarkets. Look for firm heads with crisp, colorful leaves and no signs of wilting or browning. Several varieties of radicchio are grown, but the two most commonly available are Verona, which grows in small, loose heads with burgundy leaves and white ribs, and Treviso, which has leaves that are narrower and more pointed, and tighter, more tapered heads. Other varieties have variegated or speckled leaves in shades of pink, red, and green.